I miss this. That's Onyxia on the left and Nefarian on the right. I don't miss all the work we went through to get people attuned for each raid, but I miss this end result of success. We used to joke that somewhere under Stormwind, there was a pile of rotting dragon heads and just don't order the soup in any Stormwind restaurant. 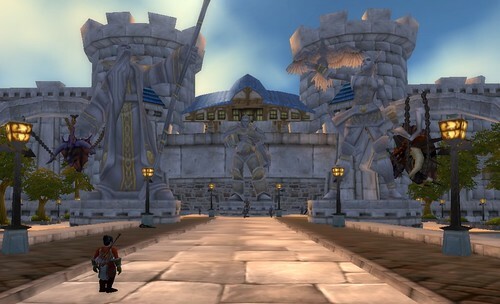 It was a mark of excellence, for us, to have downed Onyxia and Nefarian in one week; to see the results from the arches into Stormwind; to hear the city crier tell everyone they were getting "The Rallying Cry of the Dragonslayer", a buff that level 60 and under still get to damage, XP and rep.
Now days, you only see Nefarian's head from the arch. When Onyxia was made a level 80 raid, you turned in her head to the warlocks in the Mage Quarter. Who knows what they do with it. You get an updated neck piece. I still have both of mine, a testament to our work as a guild to down Onyxia in two iterations. Her head vanishes from your bags. (How did a dragon's head fit in your bags in the first place?) You don't see it in the arch. We used to hang out there and watch for it to materialize. Occasionally, I suggest that this simple part of the game be returned. For a lot of us, it was an important part of our raiding experience. For those of you who never saw this, you gotta admit, this is cool.